If your carpet is not installed properly by professionals the life of your carpet will probably suffer. We do our best to fit the correct carpet for the application it is intended to be used for. Our goal is to find a carpet that works best for you, and not just sell you any carpet to get the job. Here’s some things to look for when choosing a professional flooring company that we always do. You can compare any company to ours and I am sure the choice is clear. At Coventry Flooring our installers are employees, not sub-contractors. 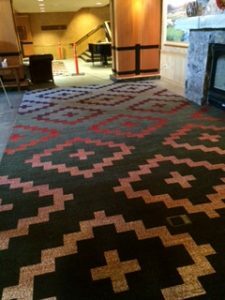 We are one of very few companies in Denver that guarantee’s the installation for the life of the carpet because we install it. Our installation crews are all insured and bonded. Coventry Carpets does it’s best to go above and beyond when it comes to the installation of your new carpet, even vacuuming the job upon completion. Coventry Carpets is a Five Star rated company, by an independent home services review company. We are only one of 2 companies that is recommended in Denver. Thank you for choosing COVENTRY CARPETS for your flooring needs. It is our mission to provide you with excellent products and installation services. We have developed this preparation letter to make your project, no matter how large or small, as easy and satisfying as possible. If you have contracted with us to move your furniture please follow these helpful tips to make your installation go quickly and smoothly. 1- Remove all knick-knacks and lamps from end tables and cocktail tables. 2- Move any small pieces of furniture into areas not being worked on. 3- Remove all dishes and glassware from china cabinets or buffets. 4- We recommend that grand pianos and antique pianos be moved by professional piano movers, but if we are moving your piano we cannot guarantee that it will remain in tune. 5- We will move TV’s, Computers and Stereo equipment, but we will not remove or replace the wires to these devices. We also cannot be held responsible for the proper functioning of complex theater room equipment or computer set ups after they have been moved. 1- Move lamps and knick-knacks off nightstands and dressers. 2- Remove linens from the beds. 3- Remove everything from the floor of closets and fold up any long clothing. 4- If you can remove drawers from dressers and nightstands it would be helpful. 5- Large bed frames or massive bedroom pieces that need to be disassembled will require that the homeowner be available to assist our installers in this task. 1- All of the above. 2- We recommended that pool tables be moved by professional movers, however if we move your pool table with furniture slides we cannot guarantee that it will be balanced once replaced. 3- Please disassemble all weight equipment prior to installation The backing of carpet can be very abrasive therefore we cannot be responsible for any damage to your baseboards. We will be as careful as possible but if they get scratched you can simply touch them up with fresh paint. Payment of your balance is appreciated at the completion of your installation. You may give the installer a check or call our office @ 303-825-0744 with your credit card number. Again, thank you for your business and we look forward to helping you with any future flooring needs. All referrals to Coventry Carpets are greatly appreciated.